Core data on existing loans is stored in the general ledger, but there may be different general ledgers for different geographies. Secondary loan data such as covenants is recorded in paper files. Data on loans to other banks resides in spreadsheets. Hedging data is located on a treasury system. Collateral, appraisals and tenant data is outdated and stored in paper files or ad hoc spreadsheets. Due diligence data on pipeline deals are in spreadsheets on bankers’ desktop computers. 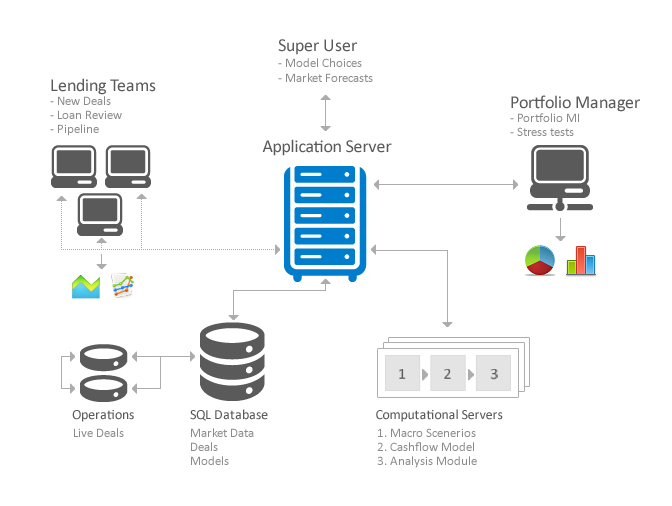 Generate reliable reporting on the portfolio or pipeline. Stress test the portfolio or individual, large deals. Monitor the credit quality or breach of covenants. Standardize the data for credit committee reporting. Performing these functions with ease and consistency requires a proper data repository for all known information about every outstanding or prospective loan. At Risk Integrated, we have designed the Specialized Finance System (SFS) to serve as the data repository with data that is sufficiently granular to feed detailed risk models or risk reports. It obviates the need for data double entry, is easily scalable as new lending grows, exchanges data with other banking systems through standard interfaces and provides a complete tenant database. The software architecture embodies state-of-the-art enterprise computing technologies. It utilizes industry-standard Extensible Markup Language (XML) Web Service protocols for ease of integration with a customer’s existing information technology infrastructure. It is compatible with all leading enterprise database technologies such as IBM-DB2, Oracle, Microsoft Structured Query Language (SQL) and others. Extensible - There is no need to define new database fields for client-specific customization. Hierarchical - It captures the complex data structures inherent to the deal structures with no need to define relationships. Portable - Encoding is transportable to XML Web Services and can be imported or exported offline. We also use Microsoft SQL for its efficiency with native XML and its complete query capability. It is also very well-suited to the data binding needed for building web-based graphical user interfaces.